Nothing can ruin someone’s day faster than a dental emergency suddenly popping up. The only thing that can make it worse is spending hours waiting in the ER or wasting precious time looking up an emergency dentist online. 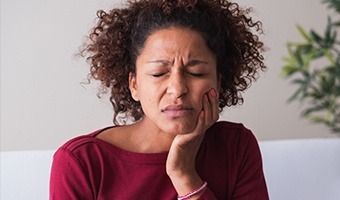 At Chisholm Trail Dental Health, patients in need of immediate dental care can avoid both of these hassles and get the care they need by simply giving us a call. We’re always happy to accept emergency patients, and we’ll work to see you as soon as possible so we can get to work fixing your problem right away. Why Choose Chisholm Trail Dental Health for Emergency Dentistry? Is the pain minor, but persistent? There might just be something caught in between the teeth, so try rinsing and flossing around it and see if this helps. If not, or if the pain is severe, then a cavity or crack in the enamel might be to blame. An OTC pain-reliever can provide temporary relief. To reduce any swelling and manage pain, place a cold compress on the same side of the face as the tooth in 10-minute intervals. Don’t chew with the remaining tooth, and if it has a jagged edge that is causing irritation, you can put a piece of sugar-free gum or dental wax over it until we can see you. Find the tooth, give it a rinse, and try to put it back into its socket, holding it in place by gently biting down onto some gauze. If this isn’t working, store the tooth in the cheek pocket or a container with milk. We can replant a tooth only within an hour or so of the accident, so don’t waste time giving us a call! Recover the restoration, clean off any debris, and try to place it back onto the tooth. If it won’t stay, a small amount of toothpaste can help. Avoid chewing with the tooth until we can repair it, and take an OTC medication to help with any pain. Wear a mouthguard every time you play sports, whether the game involves contact or not. Up to 40% of all dental injuries are sports-related! Save your teeth and don’t chew on extremely hard items like ice, pens, pencils, fingernails, etc. Instead of trying to open packages with your teeth, grab the scissors. Consistently brush and floss your teeth to keep them strong and free of decay. Get regular checkups and cleanings at Chisholm Trail Dental Health so we can stop an emergency before it even starts! Dental emergencies come in all shapes and sizes, so there isn’t a fixed price for urgent dental care. 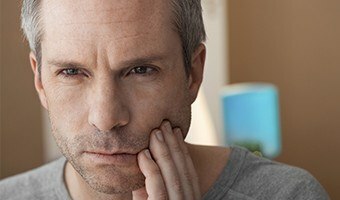 Some patients only need a small filling, while others might require multiple teeth to be removed and replaced. We’ll go over all of your treatment options beforehand so you’ll know exactly what to expect. Our goal will be to get you out of pain first so you can make any decisions with a clear head.